2017 Stingray -- Take To Germany?? 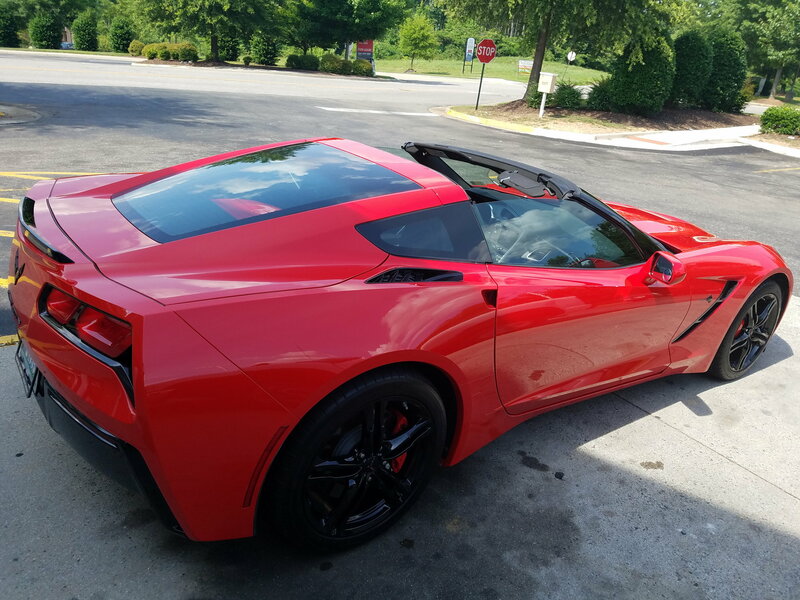 I have a 2017 Stingray 2LT coupe (7M, non-Z51) with about 6,300 miles on it. I purchased it new and it is a "garage queen" that is not my daily driver. My girlfriend is an attorney employed by the Department of Defense and is considering applying for a position in Germany at a military installation. If selected, she would start in April of 2019. If we stay together and I go with her, the government will pay to ship one car over there and also bring one back after the 4yr assignment ends. Anyway, is any work required to be done on an American-spec Corvette in order to register it over there? I know that no modifications were needed back in the 1970s & 1980s for US citizens stationed there......but I have not been overseas since I was a youth. Would I be able to sell the car to a German citizen for a decent price (with no "import duty" required) and not have to have any changes made before HE could register it? I would sink today late model Corvette would be in high demand in Europe. It is only about a 1 in 3 chance that she will get the job - and I am still torn on whether or not I would go with her. We would likely have to marry and we'd both have to sell our houses, etc. I would obviously have to quit my job and retire early - which was not my original plan. I still have 9 years left. We have a lot of things to work out, of course, if she gets the position, but it is very lucrative & our kids are pretty much grown, so that is not an issue. I can only imagine how wonderful it would be to drive the Corvette on the unlimited section of the Autobahn without having to worry about a speeding ticket. Last edited by JK 23112; 06-28-2018 at 06:40 AM. Well, if the US Department of State still had any employees, you could ask them..
i was hoping to hear from someone first-hand who has done it - but I appreciate the link. I took a vehicle over and back, you have to pass the German safety and emissions inspection, take the drivers license test and pass and then register it, have insurance and then you can drive it out of the port of entry or where ever it was shipped (there are many more things I am sure that you will need to research and now before you send it)..... it is not hard but tedious and takes time... It should be very easy to sell there for a great price as they are very sought after cars there, they even have a Germany Corvette Club and you may be able to join it and get help from them..
You will likely need to buy a car locally to drive until the process on your car is done.. You still have to do all the same things on that car.. I was there in 2000 to 2003 so things may/probably have changed since then.. look for military/DOD move to Germany links as that will be what you fall under.. I didn’t see that they were funding it the first time I read the OP. That’s a sweet deal. Last edited by Zjoe6; 06-28-2018 at 11:53 AM. I was stationed over in Germany from 2008 to 2011. Other than clean them real good, we didn't have to do anything special to either of our Hyundai SUVs. The Air Force shipped one over and we paid for the other. As mentioned in an earlier post, we had to get our license, and the cars had to pass a safety/emissions inspection. I could only get the Hyundai up to 110 MPH before it got floaty. I would love to have had my corvette on those autobahns. I am still a few months out from even finding out if she got the job - but since it is a possibility, I figured I might try to get some information about such a thing. You should ask these questions of your girlfriend, she has been there, done that, and there are regs on selling cars overseas by USG employees. Who better than a USG attorney to brief you? USG will facilitate shipping and licensing, you are importing duty free, which is why there are regs on disposing. Probably the only chance you will ever have to sell your car for the price you paid for it. Make sure you carry all purchase documents. USG frowns on members making a profit on a sale, but it used to be just donate the excess to charity. A corvette, a public access course called Nurburgring, the autobahn, and a sugar mama to pay the bills while you practice high speed driving all day...time of your life kid! Last edited by SilverGhost; 06-28-2018 at 11:19 AM. This will take a lot of consideration - by both of us. She was there before & took over a Dodge minivan - coming back with her Audi TT. I was in Germany twice when I was a kid (dad was career Army). I always thought it would be easy (take one car over + bring one back) like it was back then.......but I know it has changed over the years. If we go, taking the 'Vette is the most likely scenario and she'd just buy another car after we got there & I would have the 'Vette as my toy. Maybe I would buy a beater too, not sure. My main concern was the American specs (lighting, bumpers, etc., that might hinder being able to drive it there. I do not want her to think I am enthusiastic about going........as it is a scary thought. I could either lose her if she goes without me or I have to sell off everything I own & quit a decent job to be with her. ... or I have to sell off everything I own & quit a decent job to be with her. This is strictly my own opinion, but the only way I'd ever do all that is if the woman was my wife and I was assured of her commitment to me. It's like your whole life is in the hands of a woman who you said might leave you (if she goes there without you.) And yes I know you aren't looking for this kind of advice, but it really is something to consider. This is the question you should be asking since you threw it out there. This should not be your main concern, rather what legal status you’d be under during your time over there. Easiest would be as a DoD dependent spouse which unlocks legal staus, healthcare, and yes eases importation of private vehicles. Lacking marriage there is no easy way for you to go over there, unless you intend on coming in a tourist visa and overstaying your visit. Along with a tourist legal staus you’ll need to carefully consider other significant issues such as health care. Spent plenty of time overseas in DoD, seen plenty of younger members bring over boy/girl friends and end up in bad situations concerning health care or significant others legal status. Good luck, having a vette in Europe would be a blast, but it sounds like you have other large life decisions on this besides just bringing your vette over. We would definitely marry before going over there together. I can only get a 90-day guest visa as a "friend" or visitor, etc. If we were married (and neither of us are in a hurry to do that again), I would be a DOD spouse/dependent - with access to PX, commissary and other AAFES things. She's a retired lieutenant colonel as well as being a current DOD full-time employee. Part of the job includes 'free' housing too. We only met late last year, but things are going very, very well. Assuming she even gets the job (1 in 3 shot at it), we have a lot to consider before taking that step. Fortunately, she is an attorney (estate planning & tax law) and is knowledgeable about such matters. I have a lot of ground to cover and was - so to speak - just in the curiosity phase of this scenario. I definitely want to go to Germany on vacation, but living there is another matter entirely. She and I have some thinking to do! With the crappy weather in Europe in the winter how often would you really drive it? I guess your girlfriend will need to do the research on this through her employer's rules and regulations. . It's not her car, so I think she's going to have a problem with the shipping of something she doesn't own. It does sound like a great opportunity, but as mentioned there are a lot of things to be considered. Good luck - hope things work out for you. What a stupid answer - I drive my C7 365 days a year. Last edited by thocar; 06-28-2018 at 04:38 PM. Location: Santa Rosa Beach/Miramar Beach, NW FL. Go for it. Your car will be admired all over Germany. Some will even remember seeing it 50+ yrs from your ETA. I say that bc I remember seeing a red and white '56 Ford cruisin outside Ramstein AFB (K town) and that was 60 yrs ago. Until you added the additional info, it sounded like you were two love struck kids going overseas together. A Lt. Col? Impressive. I was in the Air Force back in the day, and spent time overseas. I later became a dependent myself because my wife stayed in for 22 years. She is also a retiree and currently working at the VA as a DoD Full Time employee. I was going to tell you that you wouldn't be able to ship your car over to Germany on the government's dime if the vehicle wasn't titled in her name, but since you say you are planning on marriage, that won't be an issue. Another issue you need to be aware of though. You will need clear title on the vehicle or a written note from your lien holder giving you permission to take the vehicle out of the country. They usually won't do that though. The vehicle is the security on the loan, and they aren't going to let you ship it to Germany. Your lady friend should be able to get you the pamphlet from the transportation management office, which will answer all your questions concerning shipping a vehicle overseas and what is needed to make it legal over there. They will be the one shipping it over there. I had to jump through all kinds of last minute hoops when I shipped my muscle car to Guam when I was a love struck kid. Paying off a loan with a few weeks notice was a huge one for me. Sounds like you got a good one. Don't lose her. Quick Reply: 2017 Stingray -- Take To Germany? ?